Dr. Paul A. Offit‘s new book documents the history of his detractors. The pediatric infectious disease specialist and vaccine researcher is a vocal vaccine advocate who has become a target for people who believe that vaccines cause autism and other ills in children. His new book, “Deadly Choices: How the Anti-Vaccine Movement Threatens us All,” follows his 2008 book, “Autism’s False Prophets: Bad Science, Risky Medicine, and the Search for a Cure” which focused specifically on the autism accusation. The new book takes a broader historical view of the anti-vaccine movement, going back to the mid-1800’s in England, when some people actually expressed the fear that the bovine-derived smallpox vaccine would turn their children into cows. “If you look at the messaging and the style of those campaigns, it’s almost identical to today,” Dr. Offit told me in an interview, noting that he hopes the book will put the current anti-vaccine movement into perspective for physicians as well as lay readers. According to the book, America’s modern-day anti-vaccine movement began on April 19, 1982, with the airing of “DPT: Vaccine Roulette,” a one-hour documentary on Washington, D.C.’s local NBC affiliate WRC-TV. It described children with a variety of mental and physical disabilities that their parents blamed on the diphtheria-tetanus-pertussis vaccine. The book also discusses today’s anti-vaccine crusaders, including celebrities such as Jenny McCarthy, Jim Carrey, and Bill Maher. The book is intended to sound an alarm.“The problem with choosing not to vaccinate is not theoretical any more. I think we’re past the tipping point. We’ve had outbreaks of whooping cough, measles, and mumps and even bacterial meningitis that are preventable, because people are choosing not to vaccinate. They’re so scared that they’re more frightened of the vaccine than of the disease…I just think someone has to stand up for these children who are suffering and being hospitalized and dying,” he told me. 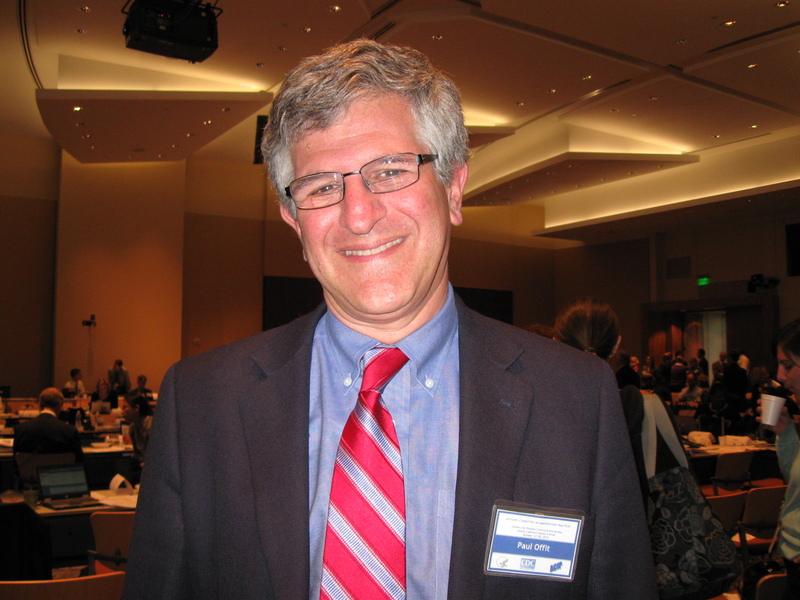 Dr. Offit is often attacked on the Internet by people who oppose vaccines, and once received a death threat by email. In June 2006, I was among the attendees at a meeting of the Centers for Disease Control and Prevention’s Advisory Committee on Immunization Practices who had to navigate through a crowd of anti-vaccine protestors lining the sidewalk leading to the CDC’s main Atlanta campus. One protestor held a sign labeling Dr. Offit a terrorist. Another yelled at him through a megaphone, calling him the devil. I asked if he’s worried about a similar reaction to the new book. “I don’t think it will evoke any more anger than I’ve already evoked,” he replied. On February 14, The Philadelphia Inquirer ran an essay by Dr. Paul A. Offit, pediatric infectious diseases specialist and childhood vaccine champion, with his take on recent developments in the Dr. Andrew Wakefield/autism/measles, mumps, and rubella vaccine fiasco. 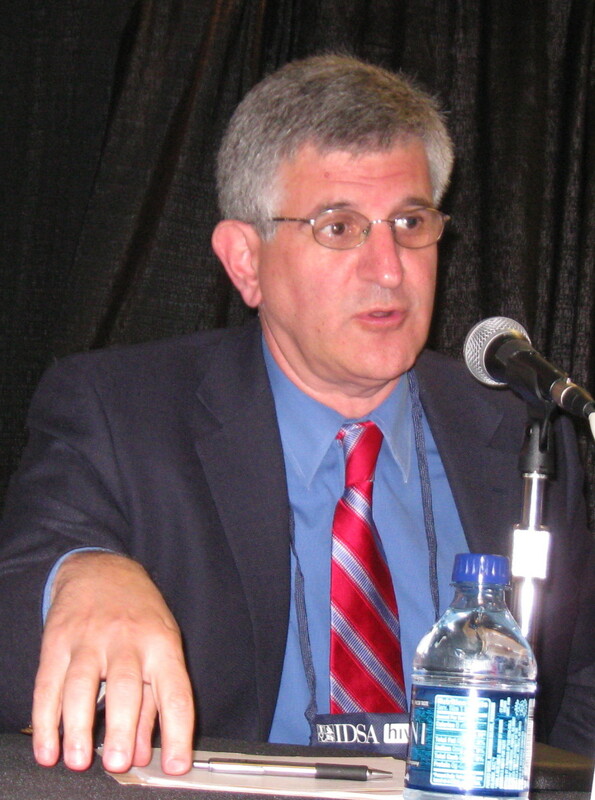 Dr. Offit, chief of infectious diseases at The Children’s Hospital of Philadelphia, has had a special interest in the spurious links between childhood vaccinations and autism, and he wrote a 2008 book on the subject. On February 2, the editors of The Lancet retracted Dr. Wakefield’s controversial and ultimately fraudulent 1998 report that purported to document a causal link between administration of the MMR vaccine to children and their quick development of autism. Dr. Offit’s essay cited other scandalous events linked to the infamous paper, such as reporting by a British journalist that showed Dr. Wakefield received more than $750,000 from a personal-injury lawyer who planned to file lawsuits based on the autism links Dr. Wakefield reported in The Lancet. These cumulative vaccine slanders “had their effect,” Dr. Offit continued. “During the last few years, outbreaks of whooping cough in the United States have increased, in some instances mimicking epidemics seen in the pre-vaccine era. And, in 2009, three children in Philadelphia died from meningitis caused by” the Hemophilus influenzae type b bacterium, “which could have been safely and easily prevented” by following U.S. vaccine guidelines. That’s a line from an Indigo Girls’ songs. While I think their questions were probably aimed at Life, the Universe, and Everything, they could just as easily have been talking about autism. I’ve covered this meeting twice now and both times I’ve been struck by how many possible autism factors are under investigation. There seems to be evidence of a role for genetics, brain abnormalities, and autoimmunity as causes of autism. Today I listened to research on epilepsy and autism spectrum disorders (ASD) and GI symptoms and ASD. This wide range of research made clear to me what a tragic mistake it would be to pin all of our hopes for identifying the cause of autism on just one factor. The evidence is clear that vaccines do not cause autism but even if there were evidence–and I repeat, there is none–it would be exceptionally harmful to those with autism and their loved ones to limit research to just vaccines. If the true object is to identify the causes of autism in order to develop effective treatments, the most productive strategy is to look at as many possible factors. Everyone affected by or working with those affected by autism should be relieved to know that a great deal of this research is getting done–albeit out of the limelight. This morning I listened to Dr. Fred Kaplan, an orthopedic surgeon at the Hospital of the University of Pennsylvania, Philadelphia, talk about Progressive Osseous Heteroplasia–or POH–a rare genetic condition, in which the body produces bone inside skin, subcutaneous tissue, muscles, tendons, and ligaments. In patients with this disease, nodules and lace-like webs of extra bone extend from the skin into the subcutaneous fat and deep connective tissues, and may cross joints–leading to stiffness, locking of joints, and permanent immobility. Researchers now know that POH is caused by heterozygous inactivating mutations in the GNAS gene. They know this thanks to some high school students, who raised more than $100,000 on behalf of a fellow student stricken with the disease. The money allowed Dr. Kaplan and his colleagues to fund a couple of fellows to work on the genetics behind the disorder. They found the GNAS mutations. The story is similar to that of Portia Iverson, whose son was diagnosed with autism. In order to help researchers study possible genetic components of autism, she put together a team that traveled the country collecting blood from families with at least two autistic children. The resulting DNA bank is helping researchers identify candidate genes through genome-wide association studies that compare DNA of autism families with that of healthy controls. Both stories point to how much power motivated patients, family, friends, and community really do have to make a difference in medical research. I often hide my name badge at meetings if it proclaims my status as media. This is almost always to ward off PR flacks. Today, I slunk out of an afternoon session of the NFID’s vaccine research meeting hiding my badge because I was just plain embarrassed. As part of a talk on autism NOT being linked to vaccinations, Dr. Paul A. Offit took the media to task for giving equal time and weight to the other side, i.e. Jenny McCarthy and the vaccines-gave-my-kid-autism lobby. Dr. Offit, who is the head of the Infectious Diseases section at the Children’s Hospital of Philadelphia, cited the late Tim Russert’s “Meet the Press'”segment, which gave equal time to Dr. Harvey Fineberg, head of the Institute of Medicine, and former Dean of the Harvard School of Public Health and David Kirby, a journalist who wrote a book about the link betweent autism and the MMR vaccine. [Full disclosure: Dr. Offit is the author of the book Autism’s False Prophets: Bad Science, Risky Medicine, and the Search for a Cure] His point was not whether it was a fair fight but that it shouldn’t have been a fight at all, given the preponderance of evidence against a link. I admit that I slunk lower in my seat to hide the day-glow green ribbon shouting “PRESS”. I’d like to say by way of disclaimer that there is a huge difference between those of us who write for physicians and those who write for the lay public. I have a chemistry degree for crying out loud. Still, I felt guilty by association. I knew immediately where the disconnect is. As a journalism student, it was drummed into my head that there are TWO sides to every story and you are doing your readers a disservice by not including both in your story. No one ever said anything about evaluating the relative weight to give to those two sides. Admittedly, distraught parents of autistic children make for very compelling reading and viewing. They do not, however, offset the eons of medical and scientific training and the mountains of data that tell us that vaccines do not cause autism. The scientists—because they are scientists and can’t say with statistical absolute certainty that vaccines do not cause autism—do not phrase it this way but it’s what the evidence amounts to. For an excellent discussion of the bad science involved in the autism vs. vaccines pseudocontroversy, see surgical oncologist Dr. David Gorski’s blog post on Science-Based Medicine. For kids with high-functioning autism (HFA) and Asperger’s syndrome (AS), “there are lots of hidden rules in the world,” Brian Freedman, Ph.D., said during a talk on interventions to improve social skills. Dr. Freedman is the director of the Center for Autism and Related Disorders at the Kennedy Krieger Institute. For physicians and therapists, this means explaining the etiquette of delicate situations to kids with these disorders. However they came to be, there are unwritten but mandatory rules of public restroom behavior, particularly in the men’s room. “You really look odd if you don’t follow these rules,” said Dr. Freedman, who included a slide showing these rules in clear language for boys with HFA and AS. Rule #1: Always leave at least one urinal between you and another person. Rule #2: Do not look at others while using the urinal. Everyone in the audience laughed. These “rules” are kind of silly and they sound really funny when spoken out loud. But we all get the joke. There’s a lot of codified behavior that we take for granted that these kids just don’t “see”. It had never occurred to me that you would have teach these “rules” to anyone. But these kids are already labeled as being weird, odd, strange, and just plain “freaks.” Can you imagine the additional abuse that you’d get at school if you didn’t follow these restroom rules? And all because you’re not wired to pick up the cues and no one thought to explain them to you. Today, as I sat listening to psychiatrists and neurodevelopmental pediatricians try to unravel the complexity of autism spectrum disorders and attention deficit hyperactivity disorder, it occurred to me that neurology and psychiatry—each trying to explain the brain and/or mind—are a lot like those derivations. On one side, psychiatry looks at mood and thought disorders that often have no signs of physical injury—like anxiety and depression—while neurology tackles brain disorders with somatic signs—like Alzheimer’s and multiple sclerosis. Both are trying to work through that black box of how the brain works—how we are “we”—but from different sides. But that wall between mind and brain—or psychiatry and neurology—seems kind of arbitrary and limiting. I’m betting that the really interesting findings will be in that black box where psychiatry and neurology merge. Maybe it’s time for psychiatry and neurology to tear down that wall.